The Helton Cemetery lies on the grounds of the Ross Creek Landing Golf Complex across the parking lot from the lodge. It has an iron fence surrounding it and has several trees in the cemetery. There are a few unidentifiable graves here. 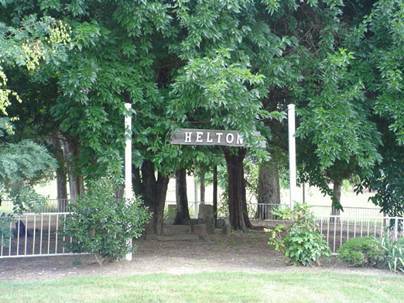 To reach the Helton Cemetery, from downtown Clifton, travel highway 128 along the river and turn right on Airport Rd. Then turn onto the drive going to the Ross Creek Landing Club House. Jones, Betty; b. 30 Jul 1868, d. 24 Nov 1907, wife of Joe A.
Riley, Lula; b. 08 Dec 1877, d. 23 Jan 1928, wife of J.O.